What kind of ACL reconstruction have you had? In a previous paper entitled Double bundle, traditional single bundle or 'more anatomic' single bundle ACL reconstruction?, I explained that techniques in cruciate ligament restoration are constantly evolving. This has largely been due to research stressing the importance of the position of the graft ligament. Early techniques use what is known as a 'trans-tibial' approach and this is still widely performed. The words 'trans-tibial' refer to the placement of the femoral (femur=thigh bone) tunnel which is drilled through the tibial (tibia=shin bone) tunnel, which is drilled first. This technique is used because historically reconstruction involved use of commercially available guides or ‘jigs’. These jigs are tools designed to make the procedure easier for the surgeon. Once the leg is positioned at a right angle on the operating table, the jig is positioned and the tibial tunnel is drilled. The drill then continues forward in a relatively straight line to make the next tunnel in the femur. The position of the femoral tunnel position is therefore dependant on the initial tibial tunnel. This procedure is relatively straightforward but it has been shown that a femoral tunnel made this way results in a femoral insertion site for the graft that is not anatomically correct. This can result in a graft reconstruction that is not optimal for restoring ROTATIONAL stability. In my practice I perform a ‘more anatomic' single bundle ACL reconstruction. I will elaborate on this using an X-ray of one of my patients who has had a routine ‘more anatomic’ single bundle ACL reconstruction. Using this technique, the femoral tunnel is drilled through an antero-medial arthroscopic portal. This allows exact placement of the femoral tunnel in a more anatomic position, independent of the tibial tunnel. I like to use the term 'more anatomic' rather than 'anatomic' as it is not possible for the surgeon to truly reconstruct the original anatomy of the torn ACL. The X-ray to the right is that of my patient, showing the bones of a right knee from the front. The upper bone is the lower part of the thigh bone called the femur. This forms the knee joint with the upper part of the shin bone called the tibia. The small fibular bone always sits adjacent to the tibia on the outside of the lower leg. On the femur to the left of the picture is a small white object, which is an 'endobutton' (made by Smith & Nephew). This is a tiny but extremely strong device that is used to hold the graft in place thus securing the graft in the femoral tunnel. Following the tunnel from the endobutton to the centre of the knee joint you can see that the walls of the tunnel have been drilled nearly horizontally. This is the femoral tunnel. I will mark this on the next X-ray. The tibia is flattened on top, and has two 'spines' in the middle which indicate the original ACL insertion. Below the spine to the right there is another tunnel which is almost vertical. This is the tibial tunnel. I will also mark this on the next X-ray. At the lower end of the tibial tunnel it appears as if there is no fixation device. There is a fixation device securing the lower end of the new graft but it is almost invisible on X-ray. These new (PEEK) screws are made by Smith & Nephew and they are completely inert. They are non bio-degradable and will therefore be there for life. They have the theoretical advantage that they don't cut the graft when they are inserted, as sometimes happens with a metal screw, and also they have a larger pull-out strength. It is important to ask your surgeon what fixation they use for both tunnels as it may not be obvious on an X-ray. This is important should any future surgery be required. It is clear that the two tunnels are not in a straight line. From this X-ray you can therefore conclude that independent tunnels must have been drilled. This would suggest a ‘more anatomic’ technique. In a trans-tibial technique the femoral tunnel is more vertical. In a ‘more anatomic’ technique the femoral tunnel is more horizontal. At the lower end of the femoral tunnel there is a small pink circle. This indicates where the antero-medial arthroscopic portal would be made to allow a femoral tunnel to be drilled in a ‘more anatomic’ position. 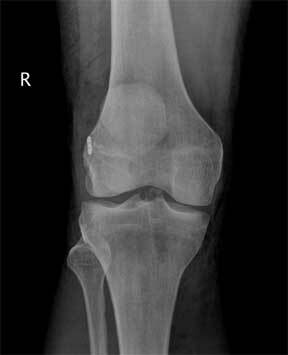 This is an X-ray of a patient who had a trans-tibial ACL reconstruction performed in another hospital. This was revised to a ‘more anatomic’ single bundle ACL, when it failed. 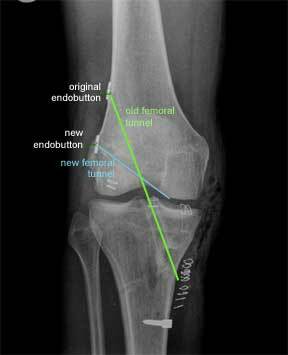 The old femoral tunnel is highlighted in green and the new femoral tunnel is highlighted in blue. This X-ray is from the front as before. The original endobutton was not removed. If you follow the line of the new femoral tunnel it is clear that it has been drilled from an antero- medial portal as the blue line points to two skin clips at this point. There are further skin clips indicating an antero-lateral arthroscopic portal and a medial proximal tibial incision made to harvest the hamstring graft and drill the tibial tunnel. The larger white implant at the lower end of the tibia is a staple. This is put in for extra support in revision cases. This is in addition to the PEEK screw which was described earlier. This is an X-ray, of the same patient, taken from the side instead of the front. The green lines show the original tunnels and the blue lines the new tunnels. 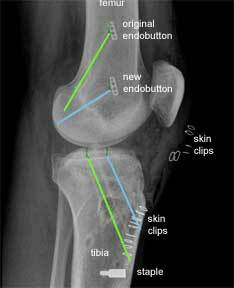 For the femoral tunnels the higher endobutton is from the original procedure and the lower endobutton is from the revision procedure. 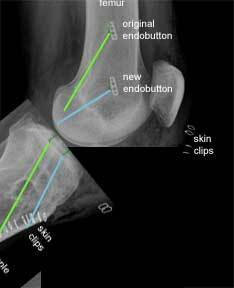 The new tibial tunnel (blue) is more anterior (closer to the front) than the original tunnel. This is a more anatomic position for the tibial insertion of the native ACL. To further help you to appreciate the differences between the two procedures, I have used a software programme to 'bend' the knee in the X-ray. 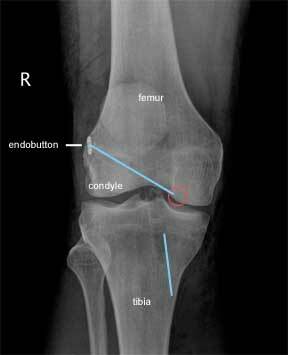 This shows that the older trans-tibial procedure leads to parallel femoral and tibial tunnels. This is in contrast to the angled tunnels achieved using the ‘more anatomic’ approach. I hope this makes it easier for you to look at your own X-rays and understand which of the two techniques you have had. If your surgery was more than five years ago it is almost certain that it would have been a trans-tibial reconstruction. Many Surgeons are now embracing the concept of the ‘more anatomic’ placement of the femoral and tibial tunnels as the quest for better rotational stability and more normal knee kinematics continues.